Ok, I have some really fantastic news for all of my gluten-free on-the-go snackers...ALL Luna Bars are now gluten-free! YES, the cupcake one. YES, the brownie one. YES, the cookie one. 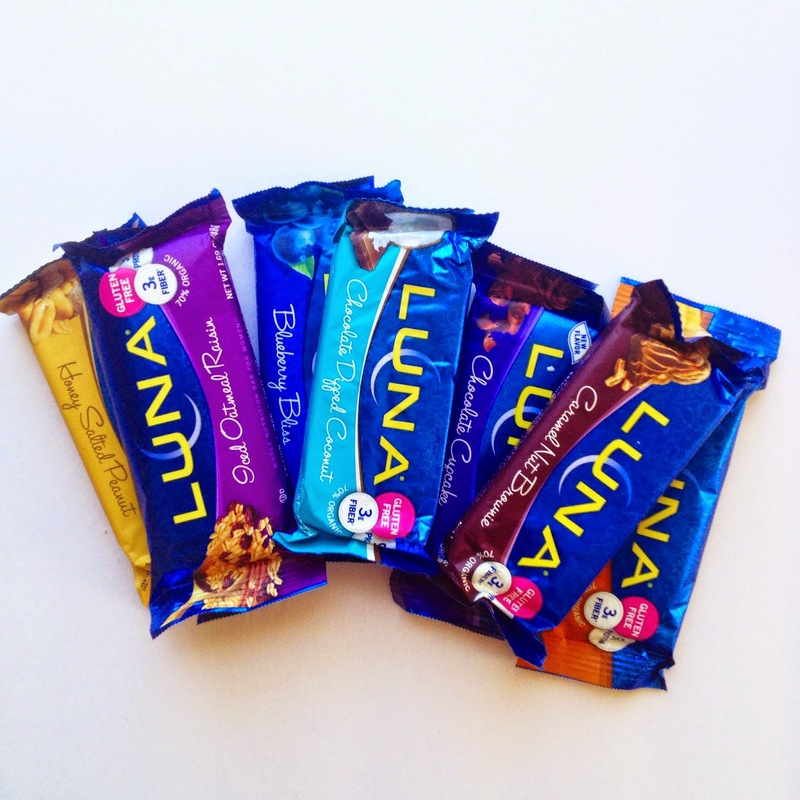 Have you tried Luna Bars? I like them because they are tasty, not too chewy, and have a well-rounded flavor profile. Granted, they have a bit of sugar, but I'm fine with it once in awhile. It's better than grabbing a candy bar, which I am apt to do now and again. Don't get me wrong, I love my Lara bars, my KIND bars, my Bumble bars, and others, but these are a part of my rotation, too. It's easy to get burnt out on snack bars. ClifBars sent me an assortment of the new line to try and give you my reviews. They sent me 7, but I like these and have tried some of the other flavors on my own, and I'm including those below. My absolute favorite one is Chocolate Cupcake. The runner-up is Blueberry Bliss. Here are the official reviews, in no particular order. Chocolate Cupcake: Absolutely delicious. Truly, it reminded me of a Little Debbie brownie from elementary school days. Blueberry Bliss: My second favorite. Beautifully decorated with a thick layer of blueberry jam and oatmeal flakes, this is reminiscent of a blueberry Pop Tart. Chocolate-Dipped Coconut: I took a box of these on a long road trip with me and they are still a favorite (that's saying a lot after eating 6 in 2 days). Caramel Nut Brownie: This was dry and hard. Not my fave...and it didn't taste like caramel. Honey Salted Peanut: Tastes like Honey Nut Cheerios! Reminds me of the Milk and Cereal bars. Iced Oatmeal Raisin: I had such high hopes for this one, but it was relatively flavorless. Lemon Zest: A cheerful and easy one to keep handy no matter what flavor you're in the mood for (sometimes you just don't want chocolate in the middle of the day, believe it or not!). Nutz Over Chocolate: A good granola-bar-esque flavor. Nothing to write home about. Peanut Butter Cookie: Quite tasty indeed. I love peanut butter in mid-day snacks, and this fit the bill nicely. Tell me, do you grab Luna bars or another favorite when you're on the run?